Spoiler Alert! This review contains detailed information on the plot and resolution of the novel Chindi, by Jack McDevitt. It is recommended that you read the novel before you read this review. I also recommend reading The Engines of God and Deepsix, the first two novels in the series, before you read Chindi. It’s much more satisfying to read the entire series in sequence. For those who haven’t read any of McDevitt’s Academy novels, a detailed introduction to the series is available at this site. 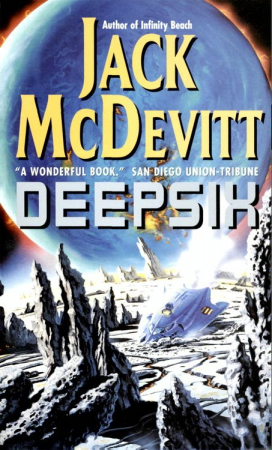 Additionally, my reviews of The Engines of God and Deepsix are here as well. Chindi continues to develop the various themes that Jack McDevitt started seeding with the first book in the series. The Earth continues to deteriorate under the burden of man’s existence. Overpopulation, drought, economic ennui, degrading weather patterns, religious strife and global warming all serve to hasten the downward spiral. Yet humans continue to go on as if nothing was wrong. The news headlines continue to be both bland recitations of meaningless power drivel, tawdry personal shortcomings and dire predictions. Life goes on and everyone pretends that everything is okay. People continue to be defined by their own shallow self-interest. Most everyone puts their own career and personal happiness above all: relationships, species growth, population control and the general health of the society. The protagonist of these novels, our superluminal pilot, Hutch, is no exception, although she does possess other attributes that make us like and care for her. She herself cares for other people, she thinks positively about the universe and she has a fundamental understanding of how it works. She’s not obsessed with power, wealth or the manipulation of others. Author Jack McDevitt again uses many of the same devices that made the other Academy books successful. He starts us out with a Prologue set in the past – in this instance, it is June 2220 – only two years before the main action begins. This time frame for the Prologue is also during the period just prior to the main action which took place in Deepsix. Unlike the other Academy novels, McDevitt does not break Chindi out into three or four sections, but rather simply goes chapter by chapter. This book also contains the close escapes that mark most of McDevitt’s work and particularly the Academy novels. With such an intense degree of action, I’m quite surprised that the Academy novels have not been turned into movies or television. In most of the books, these great escapes are not germane to thematic development, but are used to keep the reader glued to the page. However, the themes explored in Chindi are based on the concept of risk. The novel begins when a research vessel near a neutron star intercepts directed radio waves in the year 2220. Unable to trace them down to a source, the project leader, Pete Damon (a popular personality because of his program on the net explaining science to laymen), sends off all of the data to the Academy for review. Two years later, on the verge of resigning from the Academy, Hutch is asked to perform one final mission. A group known as “the Contact Society” wants to mount a mission to investigate the radio waves. Their leader, George Hockelmann (McDevitt has a lot of characters named George and they do seem to die), is an extremely wealthy businessman who has always dreamed of contacting an intelligent alien society. He has built a starship, which he is willing to donate to the Academy, but first he wants to load up his friends and go investigate the radio waves, using Hutch as pilot. She reluctantly agrees and boards the City of Memphis with George, Pete, Herman (George’s best friend) and Alyx Ballinger, an entertainer who does both live performances and sims, as actor, producer, and director. She is, of course, fabulously beautiful. They will pick up two other passengers along the way. I find it a bit surprising, in the Academy universe, that scientists would be so skeptical of the Contact Society. In a world where intelligent aliens are known to exist (the Noks), where some intelligent species somewhere created the Omega clouds, where they know that several intelligent alien societies existed recently (the Hawks and the Monument Makers), and where there are a number of archeological sites on other planets, evidence of previous intelligent existence, why would scientists denigrate any group seeking to find intelligence? This seems like a vestigial prejudice, something left over from our time that somehow carried forward into 2222. For that matter, on first thought, it is at least mildly surprising that the Noks are so easily dismissed. Pretty much everyone refers to them as “the idiots” because they cannot seem to evolve past the point of constant warfare. It has occurred to me that McDevitt might be trying to make a point about our own society – inferring that we are idiots for continuing to make war. In some of the other Academy novels, Gregory MacAllister repeatedly refers to most of humanity as “morons”, people so caught up in their religions or politics or social beliefs that they cannot see the big picture – that all they are doing is reproducing, contributing waste, destroying the earth and adding nothing to human development and understanding. Most readers, of course, would strongly disagree with the sentiment, especially if presented head-on. But by presenting these thoughts in the example of the Noks and through the polarizing character of MacAllister, McDevitt is able to distance himself a bit from an unpopular opinion. Part of the ridicule of the Contact Society from the world in general, and the scientific community in particular, is to set up a conflict between the “amateurs” seeking to make a breakthrough in contacting an intelligent species and the “professionals” who are certain they will not only fail, but make a blunder of it as well. The two passengers they pick up are a funeral director, Nick, and an artist, Tor. It turns out that Tor had dated Hutch years before, but put up no resistance when she broke up with him, so she assumed he didn’t care. In fact, Tor had fallen for her immediately, but didn’t want to seem pushy. Years later, when he heard about the contact mission through his friends in the Society, he volunteered so that he could have a second opportunity with Hutch. The relationship between Hutch and Tor is a good example of the shallow nature of the people that inhabit the Academy universe. When he knew Hutch previously, Tor was a failure as an artist, which was one of the reasons she dumped him. He worked hard and became very good, partly so that he might have a second chance with her. And she is actually very impressed that he is a good, successful artist. The dynamic is typical male behavior played against typical female behavior. Tor knows, for example, that Hutch will think less of him if doesn’t volunteer for dangerous assignments. And, of course, Hutch knows that she will feel that way, too. These appear to be simply archetypal reactions, behavior that could be demonstrated in a lab using any heterosexual male and female. But it is another example of how, despite great scientific advances, people remain the same. The book is also an example of Gregory MacAllister’s assertion in Deepsix that any time you put men and women together in a room the IQ drops dramatically. As these members of the Contact Society follow the radio signal to its origination point, another ship follows it to its destination. There they discover the remains of what was once a living planet, destroyed in nuclear war, an old moon base and gigantic stealth satellites that receive the incoming signal. While attempting to dismantle one of the satellites, something happens which destroys the ship. Hutch and her group on the Memphis race to find out what happened. After picking up the body parts, the group decides to investigate the moon base. It becomes apparent that the inhabitants were cut off from the planet after the nuclear annihilation and died from lack of food and oxygen. Hutch has to babysit the amateurs who are mucking up scene. Herman even attempts to steal an artifact. While investigating, they discover that someone else had cut their way into the base long after the inhabitants had died, but they have no clue who or why. The AI on the Memphis, Bill, discovers that there are a second set of stealth satellites in orbit, pushing the radio signals even further out into space. They follow the signal and discover a habitable planet, one that looks much like earth and that does support advanced life. There is a beautiful, intelligent flying species that they name the “Angels”. George and the others immediately want to go down to meet them, but Hutch is reluctant. Her past experience tells her that no matter what they look like, the situation could present great danger. The others somehow talk her into going. It is a mistake from the beginning. In the first place, you would think that a policy would be in place to prevent humans from barging into worlds where the technological level is low or non-existent. In fact, humans have not interacted with the Noks because they are believed to be inferior. Even Star Trek has a non-interference protocol that prevents them from blundering into societies that do not have warp capability. For that matter, when McDevitt gets to the next book in this series, Omega, the World Council has a Protocol in place that prevents interference. But George and the others go wading in and get attacked by the Angels. Both Herman and Pete are killed and the others are stunned and appalled that such beautiful creatures could behave so barbarically. Hutch is vindicated. Hutch’s courage is called into question quite a bit in this novel regarding the question of risk. She has already seen too many people die from taking stupid risks: Richard Wald, her archeologist friend delaying too long at Quraqua, George Hackett and Maggie Tufu taking foolish chances at Beta Pac III, another four dead at Deepsix and an entire ship just recently destroyed playing with a stealth satellite they didn’t understand. She sees herself as fully justified in advising caution. It certainly doesn’t mean that she is a coward, it just means that she is actually using her brains, something the others seem to have given up on. Even after the death of his two close friends, George Hockelmann still feels like they did the right thing by attempting contact. Really? With a species that was not technologically advanced? What do you gain from that? I thought the whole purpose of George’s mission was to contact a species that was at least as advanced as our own. The mission becomes completely muddled after that fiasco – now all they want to do is to “see what’s out there” and that then allows them to do anything they want. They do have a technological string dangling in front of their eyes: the radio signals. In each system, there are two sets of stealth satellites, one trio receiving signals, a second trio processing and resending them. They move on to the next system receiving the signal, except that nothing is there and the signal appears to be going out toward a galaxy. Bill does some digging, however, and finds that the signal passes through twin gas giants on the outskirts of the system. The team moves to investigate and they find two things: first that there is a moon in a vertical orbit that has a house on it and, second, that there is a spaceship orbiting one of the gas giants. The house they find is quite large and had once been occupied by two very large creatures. It is filled with bookshelves, has a courtyard in the center, and has been frozen by exposure to space for a very long time now. The view from the house – the gas giants with their ring systems and moons – is awe-inspiring. McDevitt’s description of the scene is truly fine writing, worth the price of admission on its own. But the spaceship orbiting one of the gas giants is huge. At first, they think it is an asteroid. Indeed, it appears to have been built from an asteroid. Alyx names the ship the Chindi, after the term Navajos use for a “spirit of the night”. With Tor’s support – and against Hutch’s better instincts, George decides to investigate. As the trip has gone on, Hutch has come to realize that she returns Tor’s affection and it irritates her that he has pushed for boarding the Chindi. They discover that the ship is actually automated – a roving museum, picking up artifacts and broadcasting events via the stealth satellites, a vast network of live entertainment, experienced sometimes thousands of years after it had occurred because it is broadcast at the speed of light. Fascinated, George breaks in and establishes a base to begin his investigation, along with Tor and Alyx. There is intense pressure to get it done now. Not only is an Academy team on the way (under the direction of a runaway egomaniac, Maurice Mogambo), but they have determined that the Chindi is simply using the gas giant’s upper atmosphere to refuel and it will be leaving soon. To be caught on the Chindi during acceleration with limited air and power would be to invite death. Dedicated McDevitt fans already know (more or less) what is about to happen. As soon as the Chindi shows signs that it is about to leave, the team scrambles for the exit, but they are a little late. Alyx manages to make it to the lander, but Tor gets stuck on the vehicle. George, appropriately, gets swept away into space during the acceleration. Throughout the novel, McDevitt balances the preciousness of life against the accomplishments of risk. After what Hutch has been through, she opts for life. George, on the other hand, has made the decision that no matter what happens to his life, accomplishment is most important. The problem with dying while accomplishing something is that you do not live to reap the rewards. One has the sense, as George floats away into the soup of the upper atmosphere, that he has just realized this basic truth. Throughout the novel, George’s major concern was not to make great discoveries, but rather to receive the accolades of accomplishment. He is so concerned that Mogambo will ride in and take all of the credit that he ends up sacrificing the reward. Mogambo, on the other hand, is distressed that George’s team has made all of the discoveries and he is scheming to spin the publicity to his own benefit. With George gone – and given the gullibility of the press – this is actually quite easy. The crux of the story comes down to the realization that the Chindi is not using FTL propulsion, but rather is running at sublight speed. When it reaches cruise velocity, it is travelling at .25 of light speed – this is a velocity that no Academy ship can match. Thus, Tor’s life is in serious jeopardy. Hutch provides the solution: to use several ships tied together with a massive object, so that they can obtain a greater speed and enter hyperdimensional space loaded with mass. While in hyper, they dump the load and come roaring out into regular space slightly faster than the Chindi. This proves to be another problem in that the engines are overheated and they cannot slow down enough. At this point, Hutch throws all caution to wind and risks her own life for the reward of saving Tor. She jumps into a shuttle loaded down with go-packs and air tanks and brakes the shuttle till the fuel is gone, then she jumps out and uses the go-packs to continue decelerating. Tor makes a net of cables and when she comes roaring in over the Chindi, he catches her and they both break free. The scene contains all of the usual excitement that McDevitt generates in his bold rescues. The picture of Hutch soaring in over the Chindi at a velocity of 1/4 the speed of light and catching the net is brilliantly written and completely absorbs the reader, much like the conclusion of Deepsix. It tells you a great deal about Hutch that she is willing to take a serious risk, but not for her ego; rather, she risks everything for her own personal happiness. As we see in the later novels, she marries Tor and they have several children. But this is the end of Hutch as a pilot. For the remainder of the series, she will be tied to a desk at Academy Headquarters. It is a terrific way to go out. And for her, the reward was certainly worth the risk.